Yup, you read right – 12 Weeks of Christmas Treats. But Nancy, you say, it’s only the second week of October. What the hell is wrong with you? If by “wrong” you mean right, let me introduce you to the fabulous Brenda of Meal Planning Magic who is hosting this blog hop. 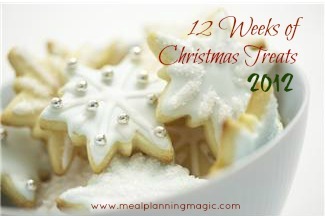 The premise is this: different bloggers get together every Thursday for the 12 weeks leading up to Christmas to link up their posts and share delectable holiday treats in preparation for the big day. To me, this is a seriously fantastic idea. I’ve already missed the first two weeks (I just couldn’t get my act together) but I’m glad to be a part of week 3. Anyone who knows me knows how much I freaking LOVE Christmas. I blame it on my Dickensian childhood where my family didn’t have much in the way of earthly possessions. As a child, I couldn’t wait for the department store Christmas catalogs to come in the mail. I’d flip through the endless glossy pages advertising all the latest and greatest toys that I would never own and imagine playing with said toys. My parents couldn’t afford to buy us things beyond life’s necessities so Christmas was the only time of year we received presents. The clothing company where my mom worked as a seamstress used to hold a big Christmas party every year and if you were 7 years old or younger, you were able to attend. There’d be free food, pictures with Santa, and the most wondrous moment of all was when each child was invited to a giant pile of presents and selected one for their very own. It didn’t matter if the toys weren’t extravagant, expensive or on trend. The simple act of receiving and keeping a gift was unbelievably gratifying. I can still remember the intense joy and awe I used to feel, sitting under our Christmas tree, all the lights off except those twinkling in the fake plastic branches above me. I used to shake the one present that I had and try to guess what was inside, sometimes gingerly peeling away a corner of the wrapping paper to see if the box would give the contents away. I will unabashedly proclaim that those moments in my life were absolutely magical (standing in stark contrast to the decidedly un-magical moments that made up the rest of my younger years). My first entry for the 12 Weeks of Christmas Treats is this jazzed up version of Rice Krispies squares. These are super easy to make and super easy to devour. Just a few staples from my pantry. 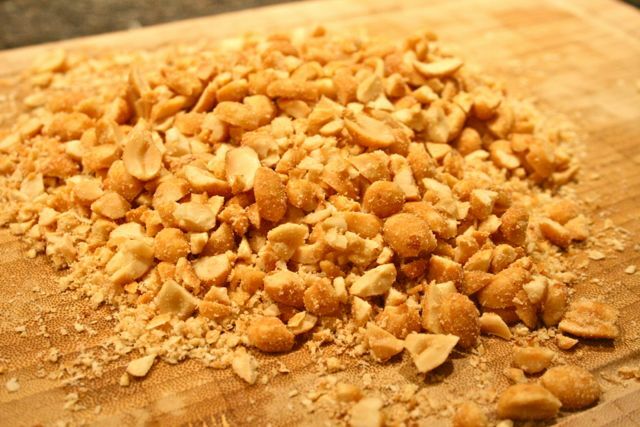 Honey roasted peanuts. 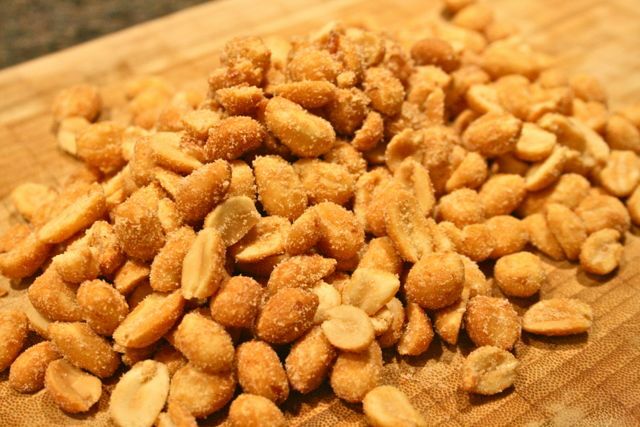 I remember my Dad used to work for the airport kitchen and would bring home bags of them, back in the day when they still used to give out honey roasted peanuts on flights. Rough chop so there are still nice big pieces. Place 1/4 cup butter into a deep pot and melt over medium high heat. Turn the heat down to medium and add the marshmallows. 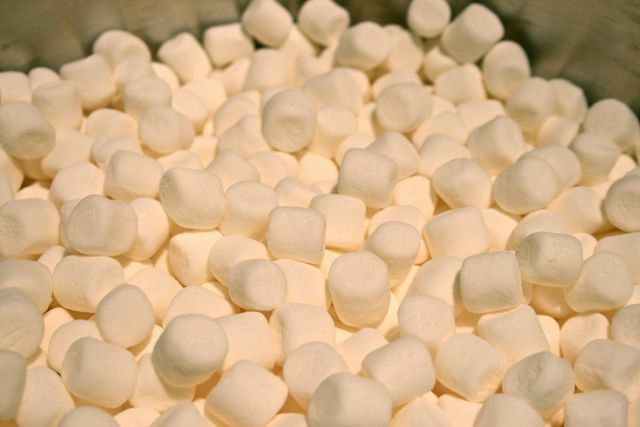 Constantly stir until the marshmallows are melted through. Stir in the salt. 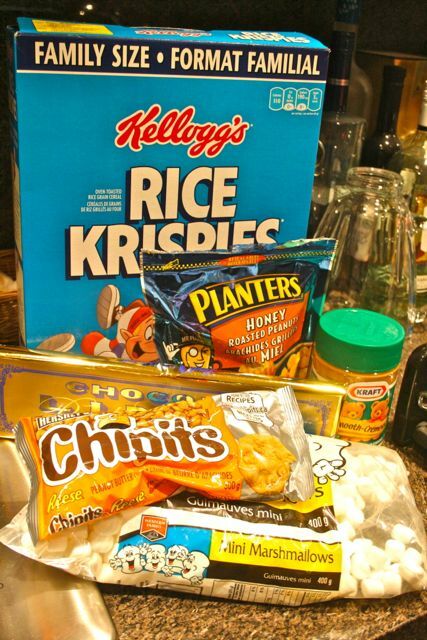 Add the Rice Krispies. I’m not actually sure how much I used – I totally eyeballed it. I don’t like to add too much of the cereal because I like my Rice Krispies squares to be super chewy. Add the chopped peanuts and the peanut butter chips. Then mix like crazy because the mixture stiffens up pretty fast. 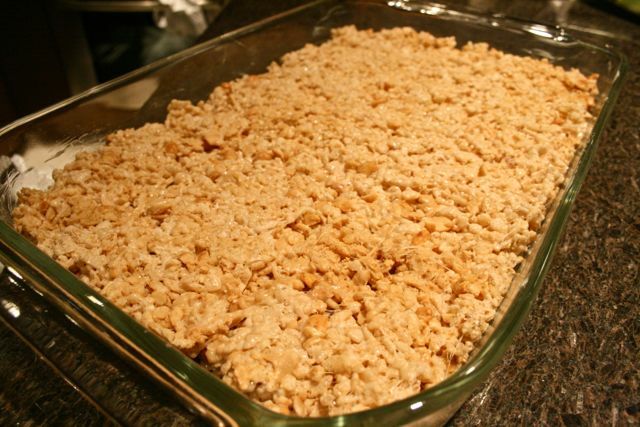 Pour the Rice Krispies mixture into the buttered pan. Press down the top until even. Let cool. To make the chocolate topping, place the chocolate into a microwave safe bowl and microwave until melted. 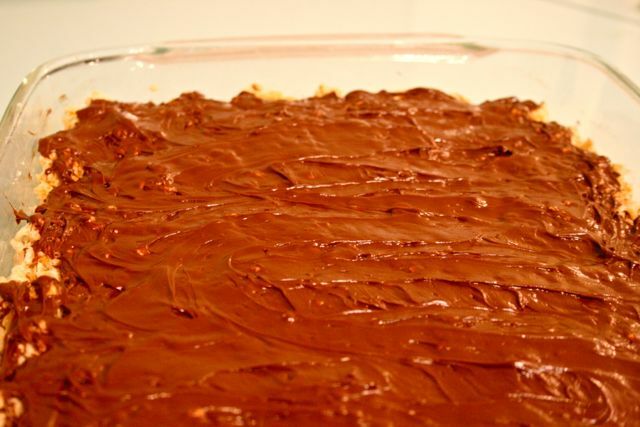 Cut in the 1/4 cup of butter and stir until completely melted and the chocolate is smooth and glossy. Pour over top of the Rice Krispies and allow to harden. Damn these are good. So chewy, so peanutty, so chocolatey. The squares aren’t too sweet because of the salt and the honey roasted peanuts. The dark chocolate topping just brings it all together. To prevent myself from eating the entire pan, I sent it to work with the Husband. I hear there were some happy employees at his office today. Check out everyone else’s holiday treats. It’s never too early to start celebrating! Nancy, I love what you shared about Christmas for you growing up! I’m sure your parents worked so hard to provide for you and your sisters. . my parents did the same and I was a pisser of a kid and didn’t always appreciate them. Thank God I grew up. Thanks for sharing your sweet story and Damn. . . These look good!! 🙂 love it! Aaawww, thanks for the lovely comments, Alice! I can’t imagine you being a pisser of a kid, but I’m sure you were spunky 😉 I was a nightmare as a teenager – always depressed, dressed all in black, and super angry. There are many more tales of childhood woe coming your way via my blog, lol. Lol, thanks! I agree – I LOVE peanuts! And together with chocolate, it’s heavenly! Yet we have another thing in common. My parents use to own a dry cleaners and my mother was the seamstress/cashier. My mom hemmed all my pants for me since I have short legs. haha. I’ll share a similair story, when I was a kid all I wanted was a cabbage patch doll. One year for Christmas my aunt gave me a gift. I knew it was a doll, based on the packaging. I opened the gift thinking today was the day, only to be disapointed because it wasn’t a cabbage patch doll. It was just a doll. Anyway I love how you jazzed up the rice crispy treats. All things delicous like chocolate, peanut butter, marshmellow and rice crispies. Great job Nancy! Isn’t it funny how much we have in common? That’s why we’re #SS besties. Yeah, so many mums from our mums’ generation were seamstresses. Thanks for sharing the story about the cabbage patch doll. I remember how popular they were – I can totally imagine the disappointment you felt when it wasn’t the doll you wanted. I always wanted a Barbie doll and one miraculous year, I actually got one to replace the cheap knock-off Barbie I already owned. When my little sister was old enough to want to play with dolls, I always took the real Barbie and forced her to play with the knock-off. What a brat, eh? Ahhh, those good ol’ days. Love rice krispie treats. Love peanut butter. Love chocolate. All in all-yes. These are wonderfull! Thanks, lady! It’s definitely a winning combo. YUM! Welcome to week 3! What you’re describing is exactly what I keep trying to tell my family–that it should be about the experience rather than an extravagance of gifts, as nice as it is that my family can afford to do that. Such beautiful memories! I’m happy to finally be a part of TWoCT! I love that you tell your family to enjoy the experience instead of expecting a mountain of expensive gifts. I feel the exact same way. Even to this day, Christmas holds so much magic and wonder for me and it has nothing to do with material objects. Thank you so much for your wonderful comment. It’s so easy to make Rice Krispies treats extra-special (although they’re pretty darn delicious in their original incarnation). Thanks for dropping by! Oh I could never outgrow these luscious treats! I love the addition of the peanuts and that chocolate ice just makes these perfect! 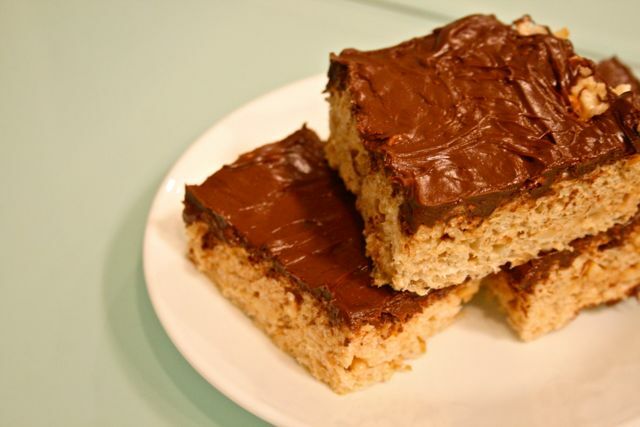 Totally agreed – I loved Rice Krispies squares as a kid and still do to this day. Yum! Love these! I have an obsession with Rice Krispies treats. There are many! on my blog. These sound de-lish! Glad you’ve started with the group! Katrina, Baking and Boys! Lol – it’s a great obsession to have! I’m so happy to finally be a part of the group. I still haven’t gone through everyone’s posts yet but can’t wait to do so. Thanks, Katrina! 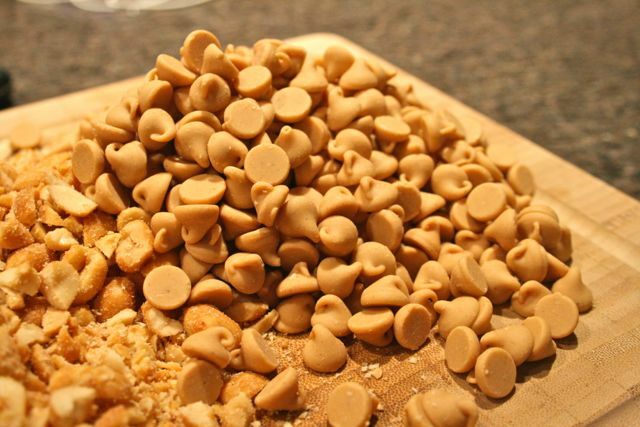 What a great way to dress up Krispie Treats. Perfect for a holiday treat. I had a similar upbringing Nancy! 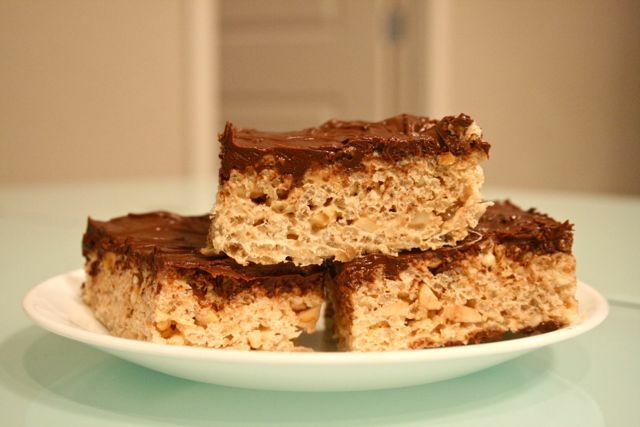 I never made rice krispies treats, but should go hunt a bag of marshmallows and make this, it sounds fantastic! So many people from our generation had the same type of upbringing. Our parents often immigrated to a country where they couldn’t speak the language, worked manual labour jobs for little pay in order to feed, clothe and house their kids. I appreciate every single thing they did for me and don’t begrudge them anything! It made me tough and self-reliant, which I’m very proud of. 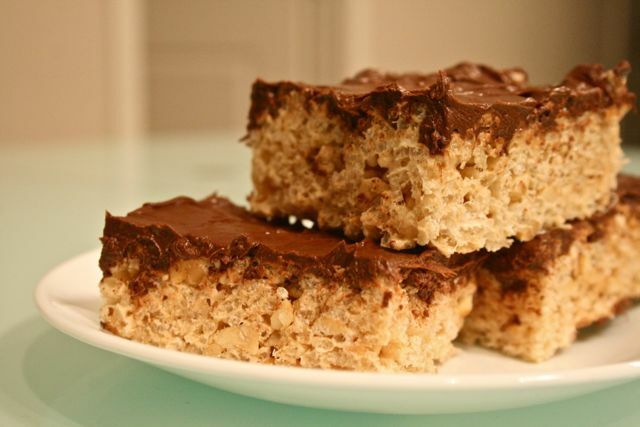 I can’t believe you haven’t made Rice Krispies treats! If you can’t find marshmallows let me know and I’ll mail you a bag (or 10)! Glad you could join us this week. I love easy treats like this during the chaos of the holidays! Those look totally decadent. Love your photos too. Opera. Do you have any recommendations to help fix this issue?